Following much discussion and relaxation, Willow is reminded of her original quest to return magic to her world. Realizing that her newfound friends have been delaying her, she decides that she must continue her journey. Knowing that Aluwyn has tricked her into complacency only strengthens her resolve. The dialogue during this is quite interesting in that it’s more introspective than the reader might be expecting. Willow has always been one of the more complicated characters in the world of Buffy The Vampire Slayer, but this really shows her depth and dedication to her craft and friends. Understanding that her greatest enemy has always been within herself is nothing new to our witchy friend. But comprehending that was never the really issue, coming to terms with her lust for power is the real battle. Becoming more self aware and enlightened, Willow discovers that she has always been Light and Dark, with neither side being stronger than the other. But just as she undergoes this internal metamorphosis, she finds that her travel companion isn’t exactly who she thought he was. Facing this betrayal head on, she embraces her powers and fights for her life. In a shocking turn of events, Willow finds herself the victor and reaches the end of her quest, though perhaps not exactly as you might imagine. Brian Ching’s art, coupled with Jason Gorder as inker, sets the whole story up. Gorgeous landscapes and well rendered characters are visual perfection. Add in Michelle Madsen‘s coloring job and you get a great graphic team. 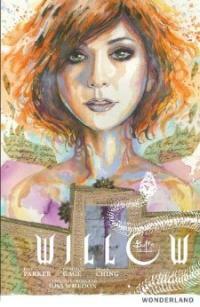 And Jeff Parker and Christos Gage do an amazing job of redefining Willow, no doubt about it. Her already broad spectrum of abilities and skills are enhanced by showing her for what she truly is, a powerful witch with good intentions. Watching her master her fears and confront her enemies, we see the strength that has made her the most formidable witch on Earth. The end result is that she is the embodiment of everything she seeks and holds dear. I won’t spoil the end, but it is perfect for this story. I love the way the writers bring the story full circle. I have to say that I honestly didn’t have a single complaint about any part of the book. The icing on the cake is the fact that David Mack did some of the cover art for this series. I have to say, he’s one of my favorite artists of all time. If you like any part of the Buffy universe, there’s no doubt this is for you. Willow has long been a support character in the show, but in the comics she has taken on a larger role. No mistaking it here, she has definitely come into her own. If ever you doubted if she was an integral part, this comic will prove to you that she deserves a bigger spotlight. Don’t miss out on one of the best stories I’ve read from this multifaceted series. Even if you haven’t read the rest of Season Nine, this graphic novel is a must for fans. Willow will never look the same to you again, that I promise.